There's a notion that stylish modern homes tend to be for younger people. But why can't the oldies have some fun, you might ask? Indeed, there's no reason why a person of a certain age cannot appreciate contemporary design or desire some modern concepts in the decoration or architecture of their house. It's often the case that when people are ready to retire, they have more savings and money to spend and are looking for a nice comfortable nest to see them through retirement and into more relaxing times. So today, let's have a look at a house specifically for the older generation. Something with both modern design and traditional values. 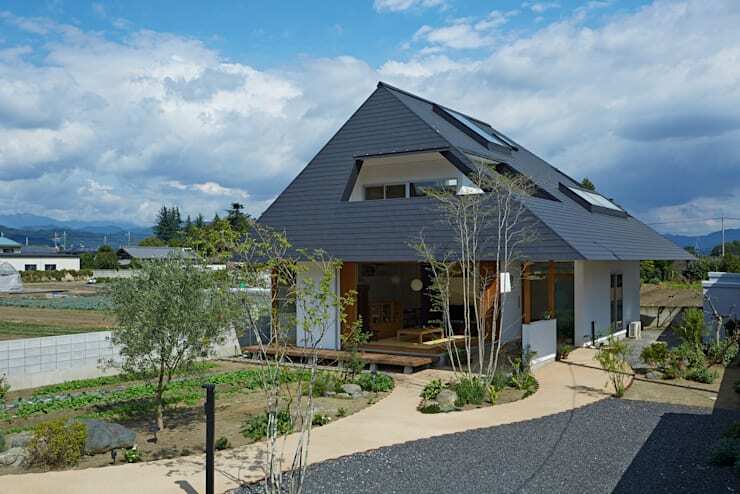 The highly creative roof of this house, with its sloping windows and cut-in balcony, really serves to impress and allows in much natural light. The first floor is open, with patio doors leading to a beautiful garden that will require a little up-keep and tender loving care. Ease of access at ground level will suit the older generation, while the open-plan living area is more traditional for this country. Huge lower-level glass patio doors and the small veranda provide a welcome place to watch the world go by or drink tea when the weather is fine. Some suave design features include the use of wooden support beams for the ceiling, contrasting with white foundation slabs. 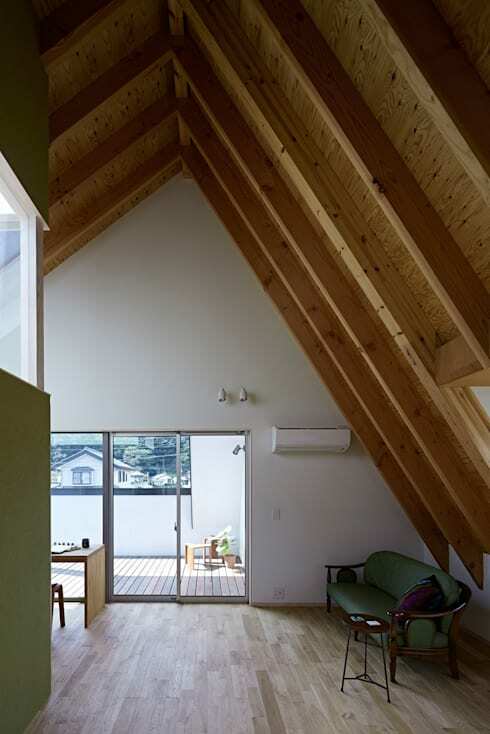 Wood gives a natural feel to the room, and the creepers hanging from the foundation block add to that effect. The door frames and ceiling are lined with more wood, as is the decking outside and the floor of the living/communal area. 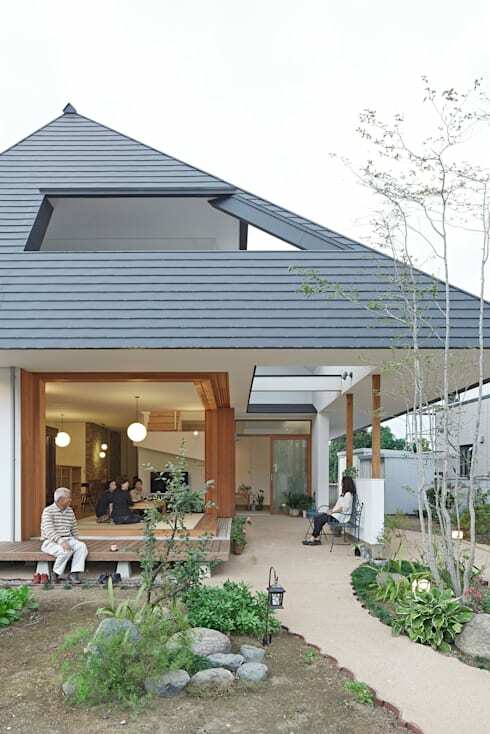 Notice how the excellent roof design and huge tinted window illuminate the area in natural light. 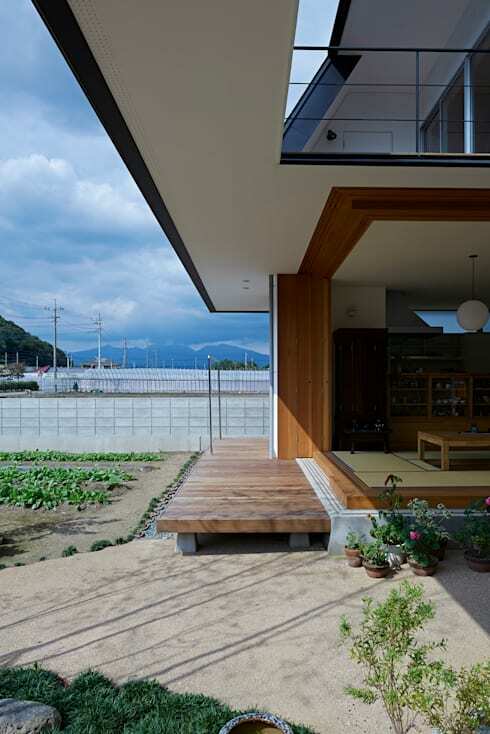 This is a place people can easily relax with flowers and potted plants, giving a real Zen feel. Here we see how the upper balcony is created by the cut-in design of the roof, allowing an abundance of natural light to flood the lower level. Gardens are appreciated by people of all ages, and the decking outside gives a nice little extra space for someone to sit down or indulge in some amateur botany. If you require the services of an architect to design a feature roof like this, one of our professionals will be happy to help! 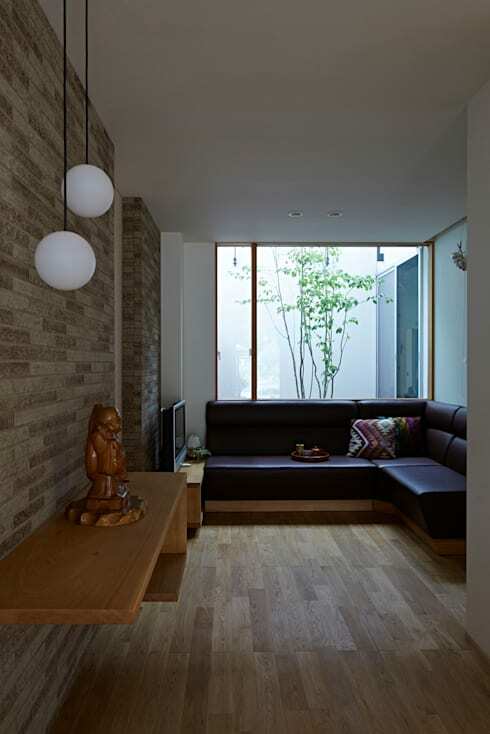 This open brick wall design gives a bit of class to the room. It's slightly darker than the wooden flooring, which in turn complements the dark leather, three-cornered settee and the warmer, beach wood of the floating table. Light is again permitted by way of a large side window, and nature is ever present with a young tree growing outside. The room is open and easy to access, especially for older people who won't have to worry about stairs or getting around objects on their way to the TV. This quiet corner is lovely place of reflection, with a trendy-retro day couch in green and a classic side table. The cut-in balcony can be observed more clearly, with its wooden decking creating a private environment in which to enjoy the sun. Potted plants and perhaps the addition of some more shrubs or creepers would make this even more of a haven. Surely a place for granddad and grandma to recline in a comfy sun chair and spend the afternoon relaxing! 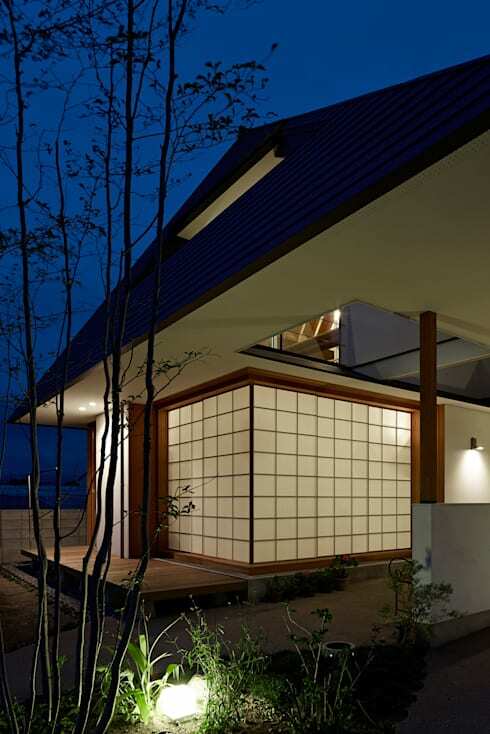 At night, the front living area closes over to become a traditional Asian partition wall, which seems to glow like a lantern in the navy blue darkness. 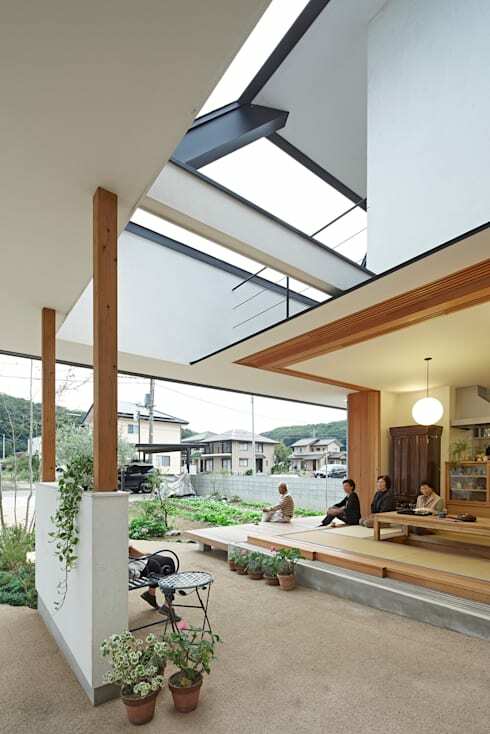 Its light spills out onto the wooden veranda and beams, creating a welcoming and cosy facade. Here we have another view of the elegant front decking and garden terrace, which is simple enough not to need any strenuous maintenance. All in all, this is a lovely, easily-accessible home for older buyers and people looking to take life a little slower. Where will you be living, when you're sixty four?